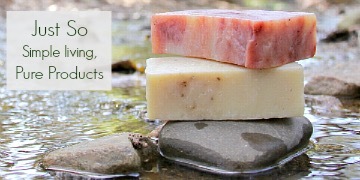 Trying to minimize your exposure to chemicals? 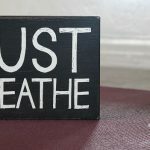 Working on simplifying your life? Consider these five DIY household hacks! Spread an ample amount of baking soda on a cookie sheet or any other baking pan. Line the cookie sheet with parchment paper if desired. (Doing so makes it simpler to pour the finished product.) Heat in oven at 400 degrees. Remove pan after 30 minutes or so. Allow to cool. Transfer to a suitable container. Voilà: washing soda! Looking for ways to use your homemade washing soda? 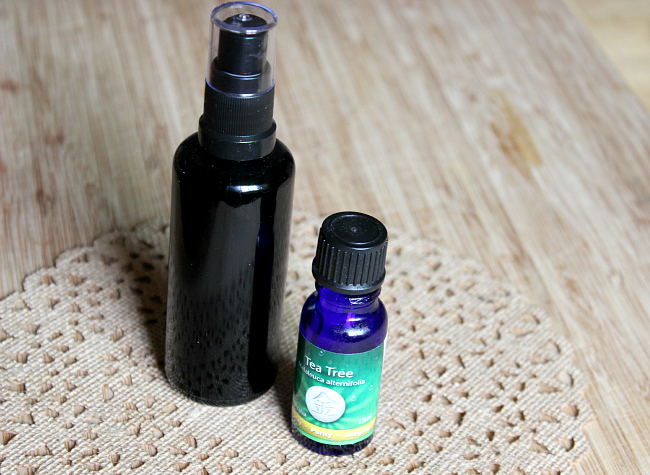 Combine 1 teaspoon vodka, 1 cup filtered water and several drops of tea tree essential oil in a spray bottle. That’s it! 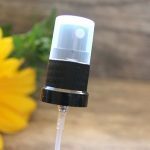 You can repurpose an old spray bottle or invest in a new one. I love Miron violet glass for sprays. You may be able to do without the vodka as this glass acts as a preservative. Learn more in the post Miron Violet Glass. Tea tree oil has a very medicinal smell. If you prefer to mask the aroma or add to the antiseptic properties of your spray, consider adding any of these essential oils. This affordable degreaser will get rid of those sticky adhesives so that you can repurpose your glass jars. It can also be used on kitchen cabinets or inside ovens for grime build-up. 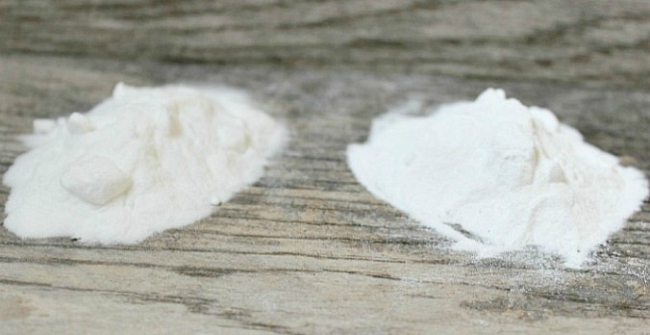 Combine 1 part oil with two parts baking soda. Stir. Apply to surface and wipe clean with a rag or paper towel. Stubborn adhesives may need more than one application. I soak my jars ahead of time to hasten the process. Are you trying to minimize your use of plastic in the kitchen? 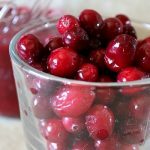 Do you have glass bowls with missing lids? You’ll love these reusable food wraps! 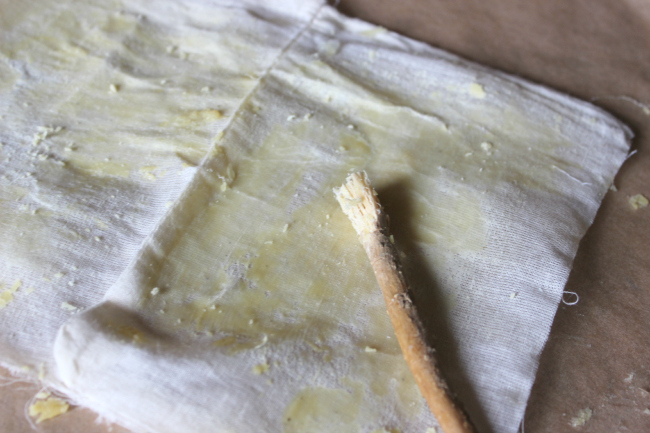 Required materials include beeswax (or other wax such as candelilla), cotton fabric, and old brush. Cut 100% cotton fabric into squares. You can adjust to various sizes, depending on the bowl or jar. I like 8×8. 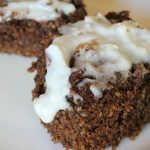 Place cotton squares on a parchment lined baking sheet. Sprinkle grated wax over fabric. 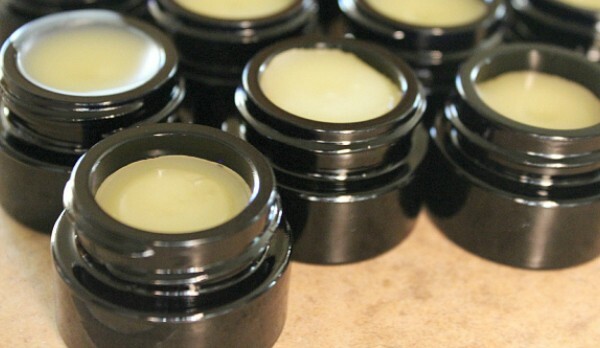 The amount of wax you will need is minimal (approximately 1/2 ounce). Hang on a clothesline (or makeshift hanging rack) till dry. The finished project will fold over jars, but won’t be as air tight as saran wrap. 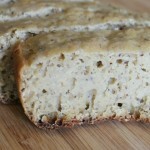 This recipe is a bit more challenging but well worth the effort. 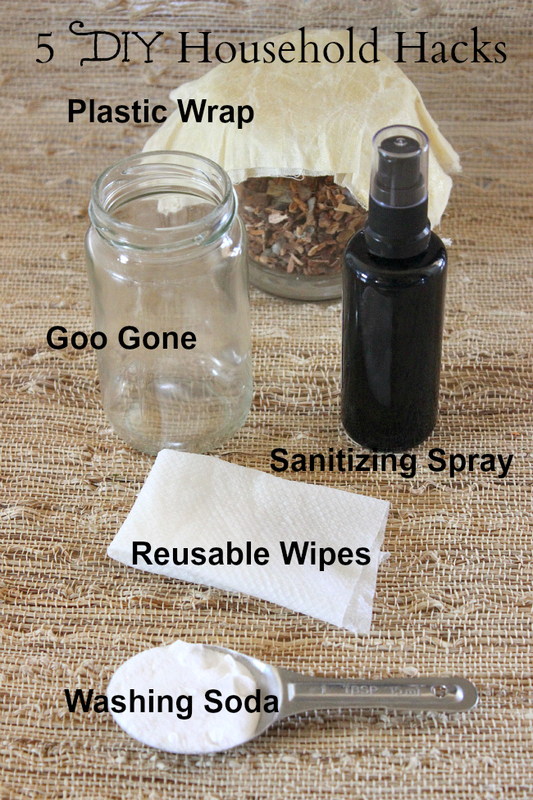 These DIY antibacterial wipes can be used on-the-go or at home. Depending on your essential oil choice, these are safe enough for babies! 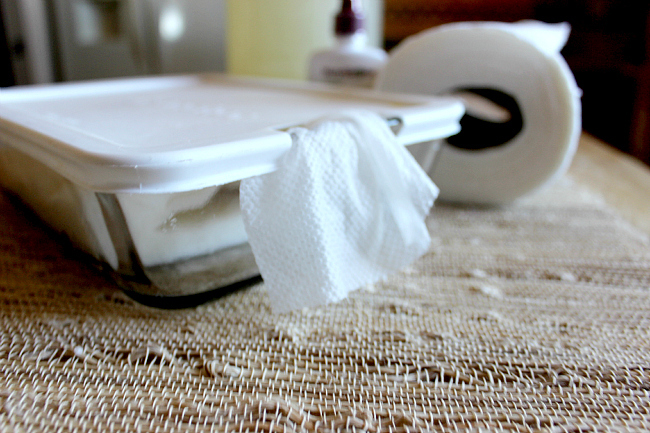 Remove the cardboard from the inside of the paper towel rolls. 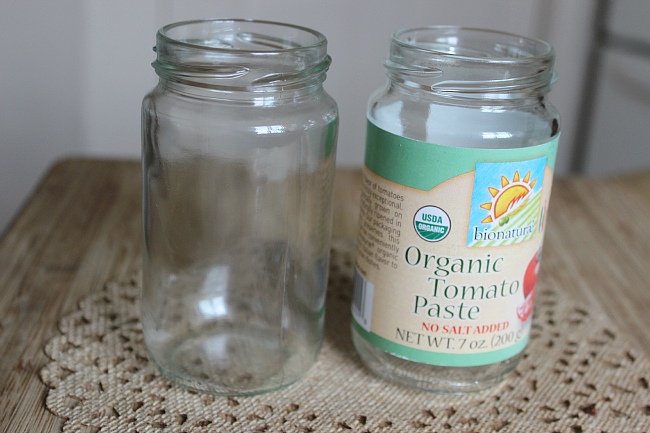 Combine your liquid ingredients and pour into an old baby wipe container or glass container that is similar in size. Place the paper towel roll into the container. Push hard until the roll is immersed in the soap mixture. Pull from the middle of the roll to get it started, before the roll is saturated. Pull the first wipe through the opening and use as needed. Simplify your life with these DIY household hacks! These five household hacks are listed in order of difficulty. 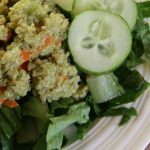 Whether you’re new to natural living, or you’ve been on the journey for awhile, chances are you’ll find something new to try! I have a question for you, I use a lot of Comet when I clean in the bathroom or when I need to scrub the chicken sink. I do rinse very well. Is there a danger in using Comet? This is so cool! 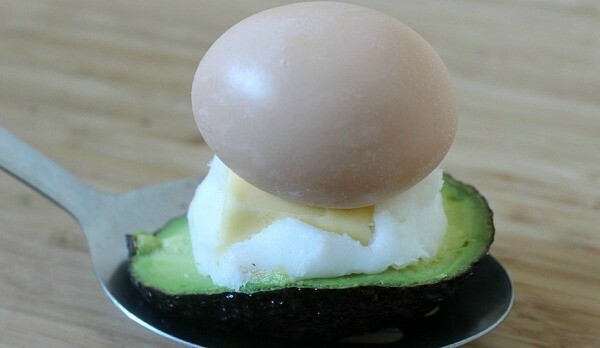 Love these natural hacks. Thanks for sharing this with us. Love these – thanks for sharing! Just curious, what kind of oil do you use for the DYI GOO GONE?? I use olive oil or coconut oil – but any oil should work, Dawn. Thank you for sharing these! 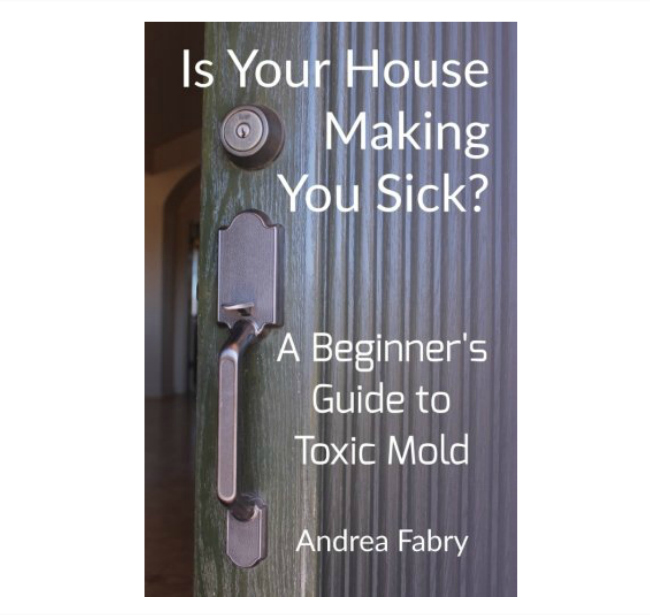 Each year, we try to eliminate more and more chemicals from our home. I get so much from your site to use. thanks for sharing. How much tree tea oil goes in the disinfectant spray? Could it really be one cup water and one cup oil? I hope not. Wow! So many great ideas and a lot that I have NOT seen before! Totally pinning this! Hi Andrea, in the cotton wrap, when you say 180º is it Cº or Fº? F. Thanks for clarifying I’ll change the post! My question is regarding the baking soda in the first hack. I use a box of baking soda in my freezer and another in my fridge. Can I recycle these after i’m done with them in the fridge/freezer, or will the freezing affect the ph? That’s a great question! I don’t see any reason why it wouldn’t work. I don’t think freezing has the same effect as heating on the chemistry of baking soda.